Encebollado de pescado is one of my favorite soups, the name is hard to translate, and literally it could be translated as onioned fish soup. 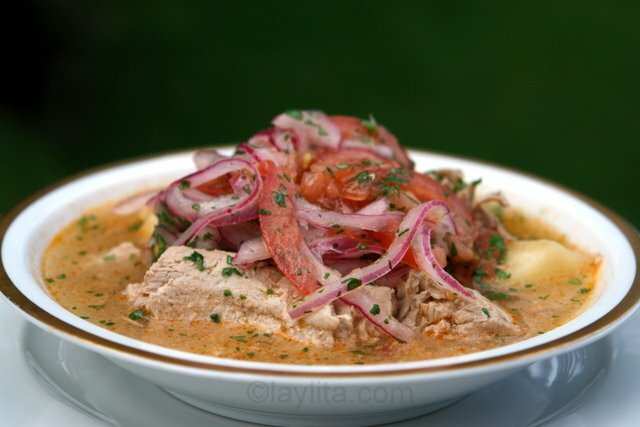 Encebollado is made with fresh tuna, yuca or cassava root, tomatoes, onions, cilantro, spices and is served with curtido or pickled onions and tomatoes on top or mixed in with the soup, the pickled onions are what give it the name “encebollado”, it is a typical soup from the coastal region in Ecuador. 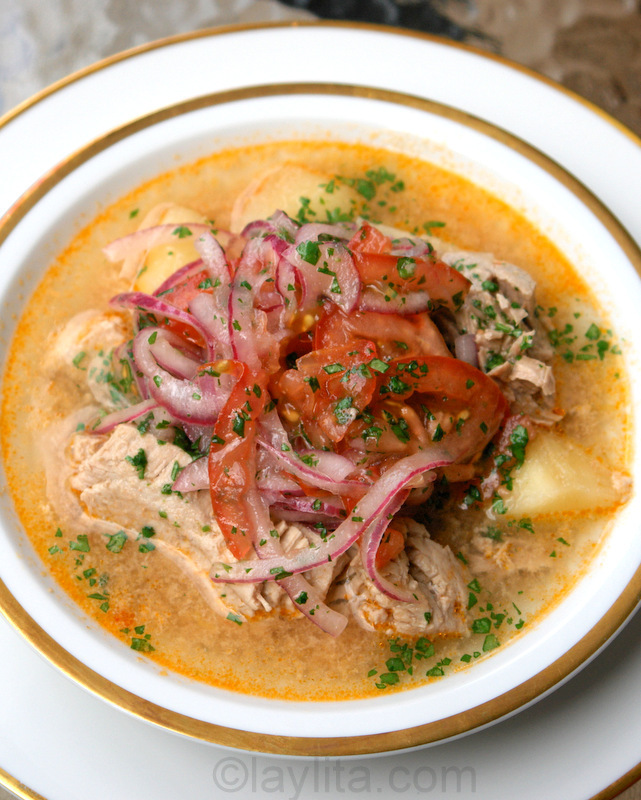 This Ecuadorian tuna soup is very versatile and can be served for lunch, dinner and even breakfast or brunch, in fact it is known as the best hangover cure (like so many other Ecuadorian dishes) and restaurants that specialize in encebollado begin serving it in the early morning. 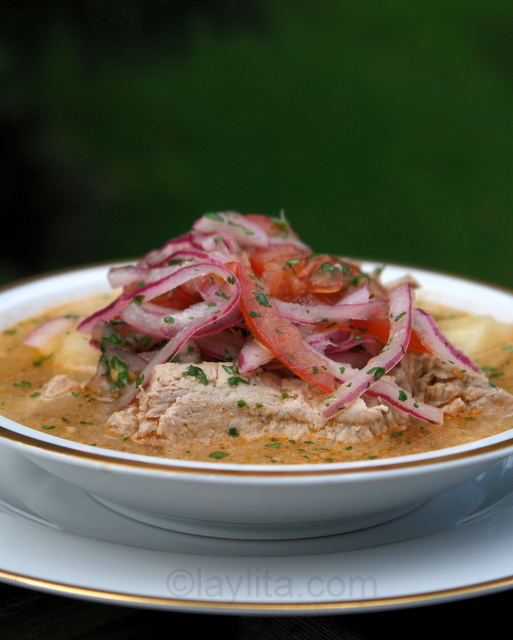 Encebollado de pescado is an Ecuadorian fish soup made with fresh tuna, yuca, tomato, onions, cilantro, cumin, hot pepper and topped with pickled onions. Heat the oil on medium heat to make a refrito with diced onion, tomato, cumin, chili powder and salt. Add the water and cilantro springs, bring to a boil. Add the tuna and cook for until the tuna is fully cooked, about 15 minutes. Drain the tuna and keep the broth to cook the yuca. Separate or break the tuna into small to medium size pieces. Bring the tuna broth to a boil and add the yucas, cook until tender but firm, about 30-40 minutes for the frozen yuca. Take the yuca from the broth, remove the strings and cut into bite size chunks. Add the yuca chunks and tuna pieces to the broth, taste and add salt if needed. Re-warm the soup if necessary and serve topped with a good amount of pickled onion and tomato salsa, if desired can also be served with chifles or plantain chips, tostado corn nuts, avocado slices and extra lime slices. Yuca or cassava root is widely used in South America. It is difficult to find good quality fresh yuca in the most parts of the US – I was able to get some decent yucas at the Fiesta store when we lived in Austin. The problem here is that when you buy the roots you don’t really know if the yuca inside is going to be good. While shopping at Fiesta one day I learned that the best way was to break the ends of the yuca roots off and check the yuca before buying it (the yuca should be completely white, any signs of brown lines or spots or dryness in the inside indicate that it isn’t good). However, while you could get away with this at Fiesta where they had huge amounts of yuca and everyone did this; I don’t think this could be done at places like Whole Foods that have a small section of 10 yuca roots. The solution is that now you can also buy it frozen from specialty Latin grocers or even online, which guarantees a minimum level of quality, but anyone who tastes real fresh yuca in South America will tell you there is a significant difference. If you are lucky enough to get fresh yuca it is important to peel it very well, there is a thin layer, almost pinkish, between the brown exterior and the white interior, that is toxic (no need to worry I have never heard of anyone getting sick from yuca) and should be removed. Yuca is usually prepared by boiling it, just like potatoes, it is done once it is soft but still slightly firm inside, the middle part of the yuca have string like membranes that should be removed either before cooking or after (sometimes it is easier to remove them after they are cooked); in Ecuador there are different doneness levels for yucas that are completely ripe and yucas that are younger, but most of the roots found in the US are probably completely if not overly ripe. Yucas are used in soups, served plain with salt as a side dish or with sauces on top, fried, grated, and even made into flour for baking, I’ve also had them in dessert recipes, but that isn’t as common as having them in savory dishes. I prepared the encebollado with frozen yuca this time, but have a picture of the fresh yuca from a previous time I made this soup. Also, like most South American and Ecuadorian dishes the recipe varies from one city to another and even from one household to another, I had the soup before with additional vegetables such as potatoes and corn, but the essential ingredients are the tuna, yuca and the pickled onions on the top. Hi Layla! I lived in Ecuador for over 2 years in my early adulthood and fell in love with the country (and especially the delicious food)! Encebollado has always been my favorite dish and I’ve always wanted to make it. Thank you for posting this recipe! I wanted to know what you think about substituting the yuca for maybe potato? Do you think it would alter the dish too much? Potato is just a lot cheaper where I live here in the states and yuca can get pretty pricey sometimes. Thanks so much for all you do, you’re such a blessing to this world! Que pase muy bien! Hi Eli – Yes, you can use potato, it will be a good soup, might not be exactly the same, but still good. I’ve had better luck buying yuca frozen, both in terms of price and quality, than fresh. Latin grocery stores and also Asian supermarkets usually have frozen yuca. Thank you so much for this recipe! My boyfriend is from Ecuador and I learned this was his favorite dish when I traveled there with him this past spring. Today is his birthday and I surprised him by making this for him today! He loved it! This was my first try at making any Ecuadorian dish ever and it turned out so well! Your directions and pictured helped me to make his birthday extra special! Thank you again!! Thank you for this recipe! I am pregnant and am supposed to avoid eating tuna steaks, but I can eat other white fish or canned tuna. Would you suggest either as a good substitute? I like this recipe so much that I would love to eat it once a week, so avoiding tuna steak is a must. Thanks! Hi Alison – You can make it with any other fresh fish (or other seafood like shrimp). Vivo anos sin ir a Ecuador y ahora que descubri tu website no he parado de preparer comida Ecuatoriana y a mi esposo de Mexico le fasina. Hoy prepare el ensebollado y me quedo de pelicula gracias. Yum! I am living in Ecuador right now, and while I haven’t eaten this recipe outside the house much, it is so good, especially on a chilly day like today. I only had canned tuna, but I think it turned out okay. I will work to get my hands on fresh fish at the Feria Libre the next time I make this. So simple and will become a staple in our house. Just made this and was immediately transported from my frosty Canadian city to a humid street corner in Guayaquil. Took me a while to find good quality yuca, but worth it in the end. It tasted just like the real thing, I wish I had made it ages ago. One of my favourite breakfasts. Your blog is wonderful, thanks so much! Looking forward to making sopa de bolla next! When we travel to Guayaquil, our first stop is to pick up a huge bowl of Encebollado. It is made almost identically as this recipe with the only “addition” not being to the soup itself, but being served with a big basket of hot, fresh, flaky bread or chifles!!! (Don’t forget the limes!!!) They are what would be classified as the “cherry on top!” My mamita is going to be so impressed when I offer to make her this soup instead of waking everyone up extra early to travel to the vendor on the calle. Hi Alicia – Yes, love the chifles with encebollado. Maiz tostado is also a great topping. I made this soup today for me and my husband. It was amazing, the best part was that we didn’t need to wake up early in the morning to beat the hung over croud at the Picanteria! Thank you very much! Laylita: I’m so grateful for your blog! I lived in Ecuador in high school, and I miss comida ecuadoriana so much! In my opinion, it’s the best (and nutritious) food! I love encebollado; my parents used to take us to the same shop on Saturday for brunch. I will be giving it a try this weekend. I’m super excited to try this :-) thank you so much for sharing. I was so excited to find this recipe. I am Ecuadorian and my (HUGE) family is from Ecuador. They’re from Santa Rosa. The closest cities to them would be Machala, Cuenca, or Loja. What’s funny is my family makes encebollado all the time, but ours is a salad. 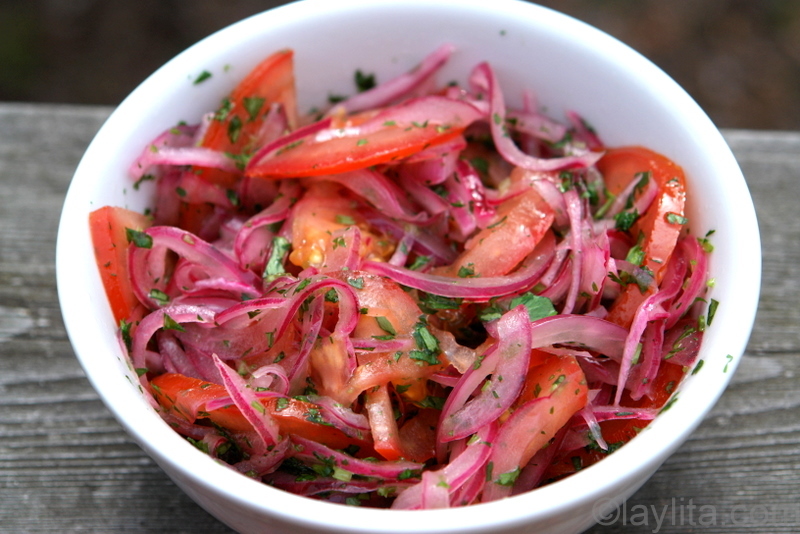 We use red onions, cucumber, tomato, radishes, cilantro, lime, and salt and serve it over rice or with plantain chips. It’s so funny how one small little country can have so many variations of the same kinds of foods. I’m so glad I found your blog, and look forward to reading more recipes. Can i use tuna from a can? Fresh is always best, you can also use other types of fresh fish. However, if you are really craving encebollado with tuna and only have tuna in a can then you can use it. wow! as with another person who wrote, i found your blog while searching for a recipe for encebollado. wow! i am very glad to have found your blog and look forward to reading more posts. Love this recipe and this site! I studied in Ecuador for a semester and this soup was one of my favorites! After a night out, a bowl of encebollado and a pack of chifles from the street vendor was just the right thing to get yourself ready for the day. I´ve made this recipe once before and it´s the next best thing from eating it on the coast of Ecuador. Thanks for putting it up here! I am so happy I stumbled across your website. My mother is from Guatemala and my father is from Ecuador. I love both places but I have to admit that Ecuador has the best food (in my opinion). I grew up eating some of my dad’s cooking which included Majado, Papas en Mani, Sopa de Pepino. He always talked about his favorite dish… Encebollado de Pescado! I’m making it tonight and if all goes well, I will be cooking it for him next month for his birthday. Thanks for the inspiration. Thank you for your wonderful website! 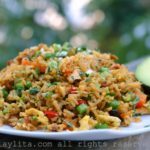 My husband is from Ecuador and I lived there for 3 years, and your recipes help me reproduce so many great dishes from there! My husband loves this encebollado recipe with albacore, but says it also needs platano verde to make it complete. The encurtida definitely makes the dish! Saludos! Laylita, thank you so much. I decided to surprise my husband and make him Encebollado on Sunday after a night out, it turned out so delicious every one that was over couldn’t believe I being the only one that is not Ecuadorian in the family could do an Ecuadorian dish so Good. Thank you sooo much i will keep trying your great recipes. This soup is so AMAZING as the other dishes are. 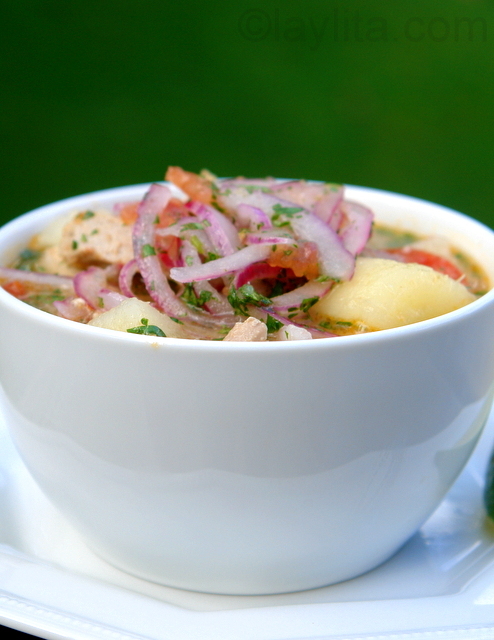 I am from Loja – Ecuador and for nothing of the world I will change this my favorite weekend soup. Thank you so much and I will recomend to my Boss it this delicious soup. Your blog is AMAZING! I stumbled upon it searching for a recipe for encebollado and am so happy I did! I’ve traveled around South American and spent extended periods of time in Ecuador. Now I’m back in the states and am CRAVING encebollado. While I was there I had it for breakfast every Sunday and would look forward to having it all week! I didn’t think the recipe would be so easy to make, but now that I know it is, I will definitely be making it for myself and my family. Thank you so much and can’t wait to start following you! Love the stuff. Tuna (any kind even albacore) is a very good choice but you can also use what they call corvina or sea bass. I’ve even made it with swordfish and it’s good. In Ecuador corvina (or sometimes the shark variety they they pass for corvina in the market) is actually the most common fish they use. Albacore is next. Fish that don’t work well are white fish (or anything like it) and salmon (salmon was gross). What they serve with the dish varies from place to place but common condiments are the thin fried plantain banana chips known as chifle, toasted corn, and even popcorn. Some restaurants will even put ketchup and mustard on the table with the extra limes for those that want it. When I make this I put the fresh cilantro on with brined (not pickled) onions along with some key lime to taste. I’m from Long beach CA, My husband is Ecuadorian and one of the things he loves is his Encebollado and he showed me to love this dish as well so I,m doing some encebollado today with this cold weather that is similar to Ecuador that your recipe is helpfull due to I haven’t cooked it for a while so I forgot some of the ingredients so this was a refresher to me and cook this delicious dish. Thank you for the recipe and keep it up. This is the most delicios plate ever created for long time….My wife veronica knows the rite time to cook to perfection her Mother showed to her when we just got married 24 years ago..best of all is the reason why i lover so much….we can not take away this website also.that help her on remembering the good stuff thank you guys!!!!!! I saw this soup on Anthony Bourdain last night and I’m gonna make it!!! Can’t wait. If there is any dish that personifies Ecuador its encabollado. This is a coastal dish and man is it great. I had it from a street vendor once and my dad forced me to eat it and I was scared too death that I was going to get sick. Man, am I happy that I had it. It was so delicious! Finally! A really good encebollado recipe! Thank you so much I’ve been missing this since I came home from ecuador a year ago. It tastes a bit different from the street vendor who sold it to me for 1.25 every morning for two years but I love it! Thank you again! I used to live in Ecuador. Even though I have not eaten in nearly ten years, encebollado is still the best thing I have ever eaten. I can’t wait to try the recipe. Do you have a good recipe for chifle? I’ll try this also…..my husband loves it …. at the restaurant….it seems to be very easy to make. I made this with salmon instead of tuna for my friend from Machala. I knew it was a hit when all he said was mmm…mmm….mmm in between each bite. I’ve made arroz con pollo and ceviche for him before, but he said this was the closest thing to home he’s tasted so far. Thanks for the great website and keep the recipes coming! Hi, Laylita! Thanks so much for posting such helpful (and beautiful pictures!) recipes for people such as myself, who have inarticulate Ecuadorian partners who constantly crave food from your country. With your help, I have been able to reconstruct encebollado, guatita, pan de yuca, etc with virtually no knowledge of Ecuadorian cuisine. 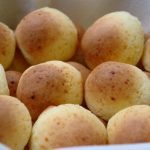 I was wondering if you could tell me what kind of bread they serve encebollado (de atun) with in the streets of Guayaquil. He is, once again, looking for it, but can give me no further explanation other than it is cheap and looks somewhat like a rectangular-ish croissant. Thanks so much! My GF from Equador made this for me, and I was apprehensive at first, but then I tried it and loved it. The salsa makes the dish! What nice recipes! I tried them and loved them, so thanks. Doesn’t it need some pepper – cayenne, black, chili? I can see that these are flexible recipes, and can probably deal with some changes and substitutions. My Dominican co-worker makes encebollado too, and she uses meat instead of fish. The recipe does call for chili powder (or a type of pepper powder that we call aji peruano in Ecuador). Ahora si muniequita linda. Le toca a Ud. hacerlo e invitarme. Espero estes muy bien y saludos a la familia.. Muuuaahhhh.. Napo. Any fresh tuna will be fine. How many servings does this recipe yield? Between 8 to 10 depending on hunger level. All I can say is that you’ve helped me to reconnect with my childhood memories and your website is my addiction. I was born in Ecuador and I live in Ohio. There are no south american restaurants here. When I visit New york, It’s hard to find a restaurant with authentic Ecuadorian flavor from my childhood. Your receipes remind me of my grandmother’s cooking and ALL the wonderful memories. She passed away and I regreted never learning her cooking secrets. Thanks to you, my family and friends are in LOVE with the Ecuadorian recipes from your site. Just one request… Do you have a recipe for boyos de pescado? It’s was my favorite growing up! Your recipes honestly brought tears to my eyes. It’s funny how much emotions can be connected to food. I love Ecuador and ecuadorian food so much! There are a lot of recipes online, but yours have been the closest to what I remember from my time there a decade ago. The photos are gorgeous too! Thank you! thanks for this– i spent three weeks in Ecuador this summer with a good friend, and now i’m just waiting for the yuca to finish cooking back here in Florida (he decided to stay in Guayaquil). I also enjoyed this dish in Montanita at 4 am. Kathryn, your comment about Moritz Thomsen peaked my interest, and after doing a bit of reading I know you were really lucky to have met him. Oh the memories of eating encebollado at 4 am in the morning! I’ve been wanting to make this ever since i returned from Ecuador two years ago, but i couldn’t remember what it is called. I suspect yucas will be next to impossible to find where i live in Australia, so i was wondering if other vegetables could be used instead? Brilliant blog btw, rock on with the good meals. Hi Tim, If you can’t find yucas you can use potatoes, also sometimes people add slices of fresh corn on the cob to the encebollado. I made this last night, and it was amazing. I loved it. It’s going to be one of my weekday dishes, because it’s not only healthy, but it taste so good. thank you. Thanks for posting this recipe. I lived in Ecuador for a couple of years and often crave a good encebollado. It was my breakfast for quite a few months. The one thing I remember that really made the soup enjoyable was a chip made from plantains. I forget the name, but we crunched them up and put them in the soup. This was on the coast in Manta. Is this another regional flair? Hi Jonathan – That sounds like chifles, I’ve never had it this way before so it must a regional thing, it does sound really good, I will try it next time I make encebollado. I made encebollado from your recipe this past weekend for my friend from Ecuador, and he just raved about it! This is the first Ecuadorian recipe I have ever tried and it was a BIG success. He actually wanted me to send him the link to your website, which I did. Thank you for posting your recipes online like this–it was such a great help! I’m sure he will find another one of your recipes for me to cook up for him–which I very much enjoy doing! Thanks again for your website! Hi Susan – Thank you for the feedback, I love it when a recipe turns out great! Thanks, Chris. I find frozen yuca at the Latino Market at Pike Place as well as at some of Mexican grocery stores in Bellevue and Renton. I’m glad to have discovered your website — it’s great! Very much in line with a lot of our favorites. Where did you find frozen yuca in Seattle? I lived in Ecuador for a while and these is one of my favorite dishes and if you like this you should try ceviche or encocado. thank you for this exquisite site. My husband is from Ecuador and I am from Romania. I was never exposed to the types of food he eats. Thanks to your website I can prepare my husband’s favorite ecuadorian dishes. The numerous pictures are also of great help. Keep up the good work with the website. I will surely use it in discovering and preparing some of the best ecuadorian dishes. Laylita: Thank you so much for a wonderful recipe, I tried today and it was great. keep up the wonderful work that you are doing. I’m trying the recipe out tonight with orange roughy instead of tuna. The last time I ate fish, prepared the way you describe it (but using fish from a freshly opened can), Moritz Thomsen prepared it for me using cracked bowls, and served in his grungly old apartment in Guayaquil, eating off my lap. It was the only time he prepared a meal for me, although we shared a cup of coffee many times. Your serving is much more elegant, but I would give a lot to have a meal served in his cracked crockery, with a hint of mockery in his voice. Your photographs are so lovely I can smell the the lovely cooking odors all the way here in Arizona. Hey, I think I’ll give it a try! This dish looks very tasty! I love the addition of yucas… Interesting!